Ruth and Richard’s wedding in the Gers. Beautiful and Bohemian . My first bare-footed bride.! 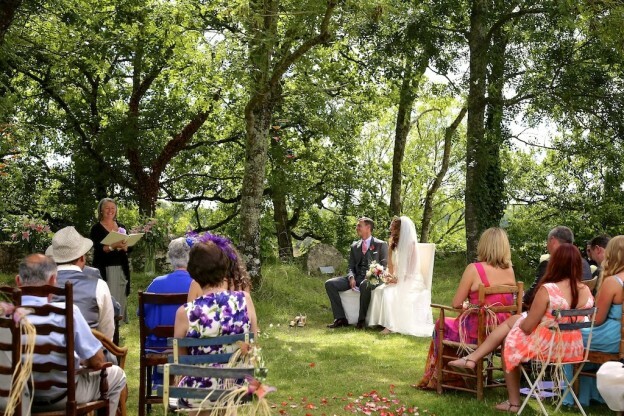 “Richard and I employed Sandie Smith as celebrant for our wedding ceremony in southwest France in September 2013. She first sent us a questionnaire to find out more about us and our relationship. When we (eventually) got around to responding to the questionnaire, we received back very quickly her suggested first draft of our ceremony. She was completely open to making alterations in any way we wanted, but for us it actually wasn’t necessary. From her work with the questionnaires and just one skype conversation, she had managed to pick up on exactly what was needed for our ceremony. The first time I read it through I was in floods of tears! And during the ceremony itself there was not a dry eye in the house, such a good job had she done at understanding and sharing our story. On the day Sandie arrived a good couple of hours beforehand to make sure we were both completely at ease. She was calm and happy and a great energy to have around; someone we felt comfortable with, as if she were an old friend. The ceremony was informal, with both traditional and unconventional elements, just as we had asked for. We have had a lot of positive feedback about Sandie from our guests, both on the day and since our return to the UK . People have said that they felt very included in the ceremony; that they found her to be supportive and understanding; that she is conscientious in doing such a lot of research into our relationship; that she has an excellent, humble approach to her work and that she makes things entertaining and funny and serious in all the right places! My Mum she said that she was just delightful!